Our Swan Handle Pewter Tankard One Pint measures 5.11 inches tall by 3.14 inches wide. 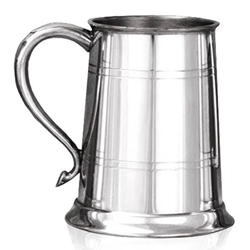 If clean lines and elegance are what appeal most to you, then this outstanding one pint pewter tankard is absolutely ideal. The straight body of the tankard is simply detailed by four horizontal lines, and the effect of regal elegance is completed by the chic swan's neck handle. All of this is added to by a highly polished finish. Composed of high quality pewter, the tankard will not tarnish and as such will remain an eye catching item for years to come.